This fall season, Etude House released a new series of nail varnish kits called "& Rose Flowering". I created a nail art look with one of the kits, and I'm excited to share about it! I love the dark tones and black lace- gives a very mysterious vibe. More on the kits and instructions after the jump! There are two kits as mentioned, and the color themes are slightly different. The each kit has two polishes and a set of lace nail stickers. 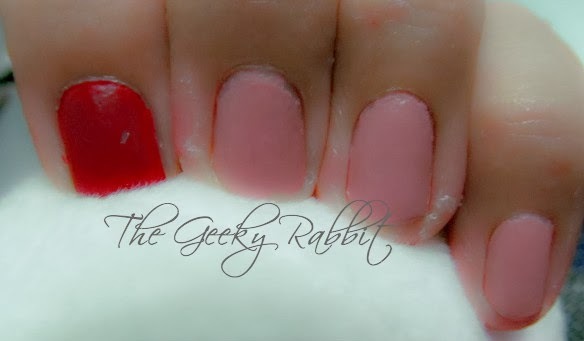 The darker red and pink polishes both dry out matte, and gives a velvety finish. This can be seen in the photo above. It's actually slightly dull, and not glossy (unlike most polished that I've received). The polishes dry extremely fast too! They are very pigmented, so they only need one coat to give the color as shown above. For these polishes, no top coat is necessary. I personally prefer the matte texture for a more unique look. 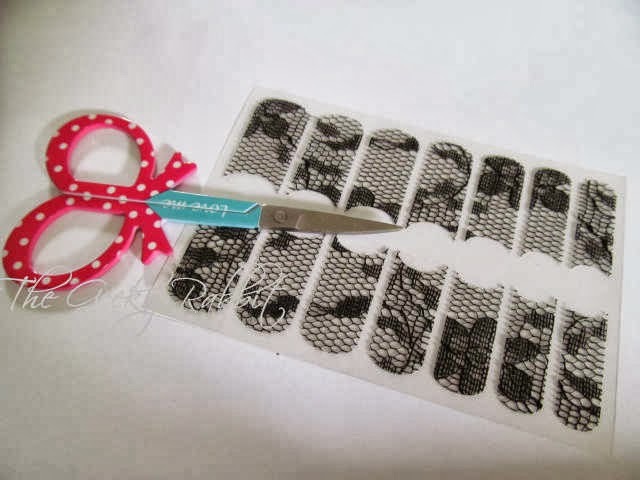 An essential when using nail art stickers is a pair of nail scissors! I use the nail scissors to cut the decals to the suitable size and shape. This pair of scissors is from Etude House as well. Isn't the ribbon-shaped handle cute? The adhesive of the lace sticker is pretty strong. The lace is not printed on the sticker. Rather, it is real lace! 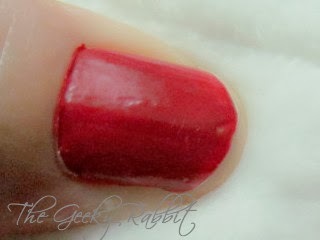 It has great texture, which gives a very nice contrast with the matte polish. 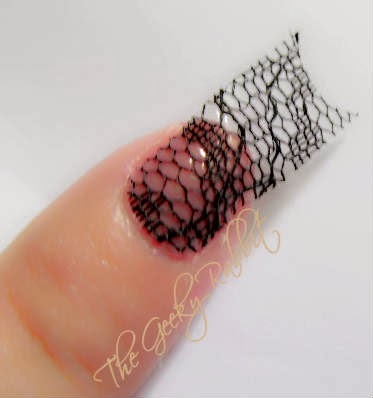 In the first look for my thumb nail, I tried a slanted lace look by cutting the decal diagonally before pasting it on my nail. Each decal is actually pretty long, so the edges need to be trimmed. The remaining decal can actually be saved to do other nail art looks. 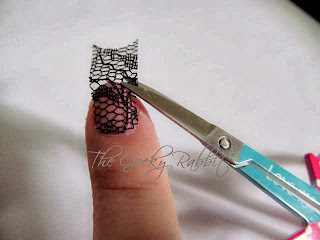 Here, I am doing a full lace decal on the entire nail. 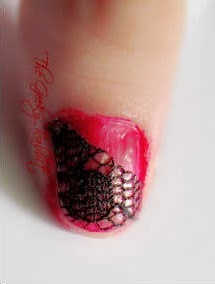 The muted pink polish give a very sweet contrast and brings out the lace pattern. 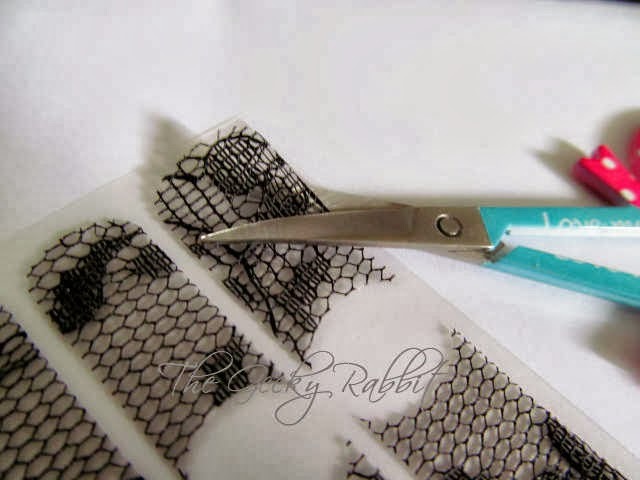 Here, I use a remaining piece of the lace to do a small heart design. Not the best heart cut-out, as it's not easy to cut the lace to a perfect heart. Nonetheless I'm still working on it! Another look that I tried is to do a french manicure with the lace sticker. I love the texture contrast, and it is a very unique take on the classic design. 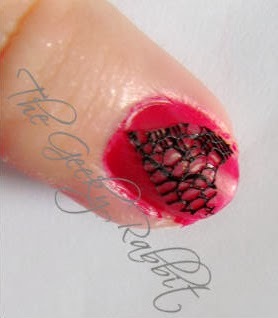 The last look that I tried is a half-moon manicure with the french lace. I even added a bit of black polish to amp up the contrast. 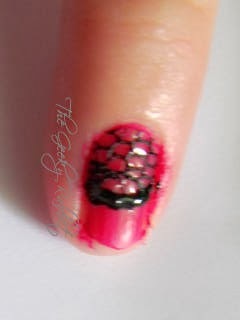 Here, I used the Etude House Mini French in Black to paint the curved line across the nail. The completed look as above. The black lace and red reminds me of a masquerade! Dark, mysterious and slightly flirty. 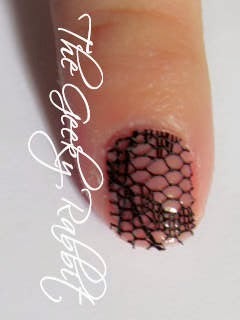 I especially love the lace decals and the endless possibilities of nail looks that can be done. And as with Etude House polishes, the colors are true to the swatches and are very pigmented.